Recently I came aware of a new file explorer program called FileVoyager and One Commander. The File Explorer type software market has become very saturated of late, especially on the Windows PC platform. Therefore both software packages referred to above can be downloaded for free. That is to say that they are donationware so if one likes them, they can donate to their creators. Usually, free software lacks many of the powerful features of a mature software suite like Directory Opus (hereafter DO) or have little innovation or both. Surprisingly, I believe both programs that I sight, are full of innovative features with advanced human interface elements. The main ideas in these programs are around file imaging and viewing. Although these elements are not new, they do the job much more fluidly than GPs Directory Opus. No doubt, these interface elements have been inspired by Apples' MAC OS interface. Especially the scrolling album type interface which first appeared in Apples' iTunes, in which one can view many file types quickly but in a more visually rich way. Scrolling thumbnails in my view is a more modern approach to display album covers for music, movies and also for pdf or any other image type file formats. One Commander also borrows the cascading column type interface that was first seen on in the Next Operating system and then incorporated into the Mac OS. However, the real innovation of One Commander is how it images all graphic type files. Its interface is consistent, and one can browse graphic type files very quickly and incorporates a very quick preview of all graphic type files. The real innovation, however, is the content-centric approach to file management. Any file can be moved, copied or manipulated. There is no need to hunt for menus. A right-click on a file brings all the tools one needs to do something immediately to hand. I am not saying that these programs are better or more powerful than Directory Opus, but together they do give hints on the direction that GP Software should be heading towards to give DO a more graphically rich and more fluid human interface for future versions of Directory Opus. Unfortunately, the DO interface is now showing its age when compared to these more modern offerings. What do others think? I had not heard of FileVoyager before, but after a cursory review will take a wait-and-see approach considering it appears to be a project of one that went without any development for 18 months. I have One Commander and find its use of Miller Columns easier to manipulate than the traditional file explorer/breadcrumb approach. That said, I'm not a Mac guy and find both the toolbar layout and file manipulation approach baffling at times. I paid for the app and will continue to support, but don't find myself using it all that much. As to DOpus, it's out-of-the-box vanilla interface may seem dated, but the ability to manipulate layout and customize toolbars quickly overcome this perception provided a user is willing to make an effort. Make no mistake, DOpus is not for everyone, nor do I think it is designed to be; it's a power user's file manager. In addition, given users can extensively customize the interface, toolbars, and right-click context menu via built-in DOpus features and extensive scripting, it makes up for any aesthetic flaws. I personally don't see the need for a built-in file diff tool a la FIleVoyager given DOpus' ability to tie-in with third party tools (both free and paid) via the command line and interface/toolbar customization. 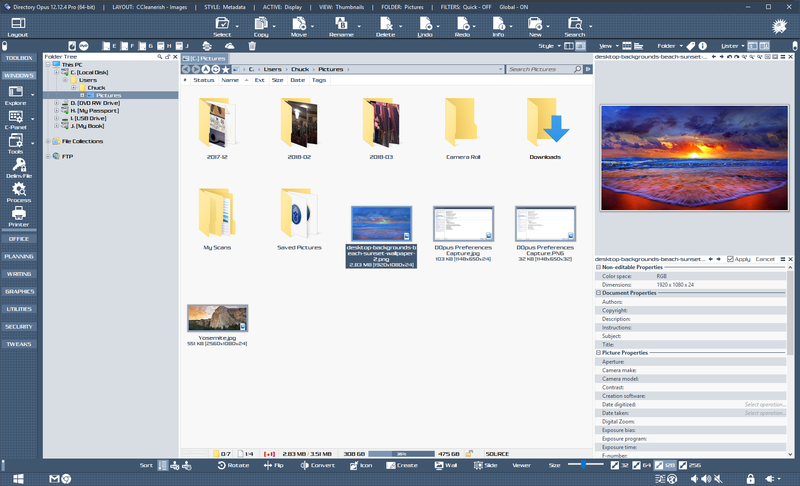 That said, I would also like to see improvements in multimedia file presentation/interaction and other GUI elements. I know the DOpus team continues to work on it, while the community continues to contribute some incredible ideas and no-kidding script contributions that improve workflow form a variety of angles.